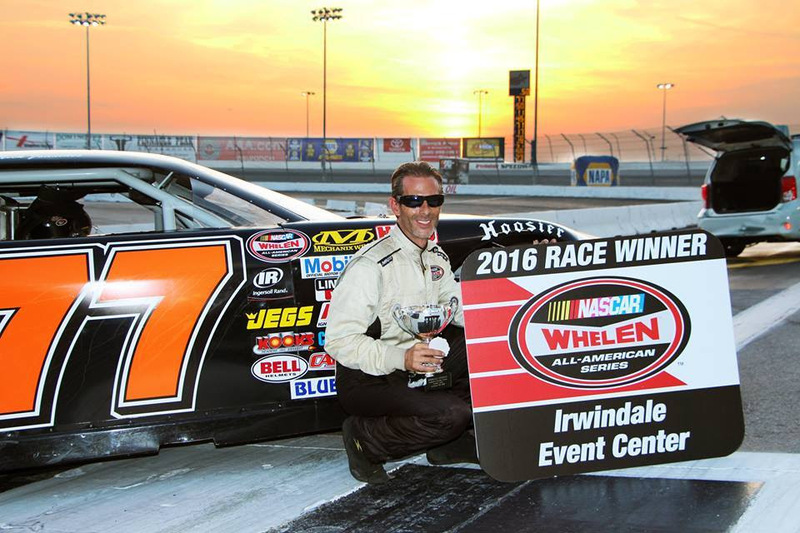 Performance P-1 Motorsports ended the 2015 season at Irwindale Speedway in victory lane and picked up where it left off in the 2016 season opener with a repeat trip to the winners circle. Nick Joanides driving the #77 PP1M Impala SS qualified 4th and took the lead on the 4th lap leading 46 out of 50 laps to capture the victory. Juan Garcia made his first start in the NASCAR K & N Pro Series driving the PP1M # 77 Impala SS. Juan driving for the first time in the West Coast's premier division had a good race going moving up to the 13th spot before a cut tire took him out of contention. Rookie Alec Martinez making his debut in the PP1M # 88 Impala SS had a rough start missing qualifying and had to start at the rear of the field. He made the best of it and finished the night in 12th. Special thanks go out to our sponsors who without we could not race this good, King Taco Restaurants, Stoughton Printing, Jan's Towing, Pick your Part LKQ, Wallace Signs, Brothers and Arms, Los Angeles Dye and Wash, Ron's Rear Ends, Eibach Springs,Chemically Imbalanced, Bull Dog Gym, AllStar Products and Back in the Day Classics. A shout-out to our crew Charlie Price, Larry Nava, Vince Covarrubias, Chris Greaney, Jason Fraze, Hector Mora, Nic Fusco, Jan Helsel and Luke Olinger. SACRAMENTO, CALIFORNIA (March 21, 2016) – Dylan Hutchison charged through the field to place third in the opening round of the Orchex King of the Wing Western Sprintcar Series, Saturday night at Madera Speedway. Hutchison drives a family-owned #8 LearnPort / Royal Purple Beast Hutchison and competed against a 15 car field on the one-third mile asphalt oval. Saturday's races will also be televised on MAVTV with a tentative air date in May. Hutchison concluded practice with the third best time with a 12.570 / 93 mph lap around the speedway. That set the stage for qualifying where the All Valley Tow #8 ranked seventh with a 13.072 second lap after spinning from loose conditions. Hutchison looked to rebound from the qualifying effort in his eight lap heat race. In a field that included championship contenders Davey Hamilton, Jr. and AJ Russell, Hutchison led all eight laps after charging from the second row into the lead on the opening lap. He took the checkers in the lightning fast heat race for the victory. 15 Orchex King of the Wing Western Sprintcars pushed off for the 30 lap feature with the MAVTV cameras rolling. The race started off with a bang with several cars crashing into the front stretch wall. Hutchison emerged from the incident in the sixth position on the ensuing restart promptly passed Tom Baker for fifth. He then passed Justin Kawahata and Cody Gerhardt to advance to third by lap 13. With open track in front of him Hutchison drove hard to reel in Robert Stout before a spin in turn four ended that effort on lap 18. Despite only 12 laps remaining Hutchison went to work using the outside line to methodically pick his way back through the pack. He passed one car per lap to rank third by lap 24. Hutchison chased down Gerhardt for second place but fell a few car lengths short at the line. Saturday's race was Hutchison's first carrying the Royal Purple brand on the side of his sprint car and the third place finish gives him a great start to the 13 race Western Sprintcar Series campaign. The series takes a break until May 7th when the compete again at Madera Speedway, before a trip to Rocky Mountain Raceway in Salt Lake City, UT on Memorial Day. Spring is here and that's a sure sign that more and more paved ovals are going to be opening for the new 2016 racing season. Coming up this weekend we will be treated to season opening races from the Las Vegas Bullring and California's Speedway Willow Springs along with another round of high qualify track action at the Loan Mart Madera Speedway. LAS VEGAS MOTOR SPEEDWAY BULLRING. 3/8 MILE. LAS VEGAS, NV. www.lvms/bullring MARCH 26TH. It's Vegas baby and the Bullring will be opening their 2016 season, this Saturday night, by presenting the NASCAR Whelen All American Series. Highlighting the evening will be the season debut of the NASCAR Super Late Models along with the Super Stocks, Bombers, Grand American Modifieds, the USLCI Legends, Bandoleros and Thunder Roadsters as well as the fun of skid plate racing. The Bullring weekend actually begins on Friday night with an open practice session for all of the racing divisions from 5:30 to 10:30pm. The grandstand will be open for the fans free of charge. On Saturday race day the racing will run from 5 to 10pm. General admission tickets are $8 for adults. For other ticket options, you can call 1-800-644-4444. This outstanding facility has a long standing reputation of being fan friendly. If there are two words that absolutely belongs in the same sentence it's definitely Vegas and racing. SPEEDWAY WILLOW SPRINGS. 1/4 MILE. ROSAMOND, CA. www.thespeedwayatwillowsprings.com SATURDAY, MARCH 26TH. It's opening day this Saturday afternoon at Speedway Willow Springs and the track that proclaims "we are Bristol in your back yard." has lined up a full day of racing to support that proclamation. Opening day is being designated as the Ran Cran Memorial and the race schedule is fully loaded in honor of that gentleman. This Saturday is a day event, with a 1pm start, and is being presented by Platinum Loan and Jewelry of Lancaster along with Pinnacle Peak Steak House of San Dimas and Colton. Highlighting the racing agenda will be a special appearance by the Southwest Tour Trucks who will making the first of three visits to Willow Springs in 2016. There's also going to be action from the popular Hooper's Rear End Service Elite Division. This unique division allows Super Late Models, Late Models, Modifieds, Southwest Tour and Spec Trucks to race together under the auspices of one rule book. Also present for opening day will be the Platinum Loan and Jewelry Street Stocks, the Wayne and Dave's Automotive Hobby Stocks, the So Cal Enduro Series, the Mini Stocks and the always entertaining Skid Plate cars. Put it all together, and that's a lot of racing for a $10 ticket. By the way, kids age ten and under will be admitted free. LOAN MART MADERA RACEWAY. 1/3 MILE. MADERA, CA. www.racemadera.com SATURDAY, MARCH 26TH. The fastest one third mile in the west will be spending Easter weekend treating their fans to the high quality racing show we have all come to expect from them and, in keeping with their policy of creating fun for all ages of the family, they will also be treating the kids to a big egg hunt on the track. Providing the on track Saturday night action will be Madera Late Models, Madera Hobby Stocks, Northern California Pro 4 Modifieds, the MST, Toyota Sedans and 4 Bangers plus a special 25 lap exhibition race showcasing the speedway's new Junior Late Model division. The Madera Saturday night actually begins late in the morning with an 11:30am practice session. Qualifying rounds will start at 2:30pm followed by heat races at 5pm and main events at 6pm. General admission tickets are are $13, $7 for youth age six to 12 with kids five and under admitted free. KERN COUNTRY RACEWAY PARK. 1/2, 1/4 & 1/8 MILE OVALS. BAKERSFIELD, CA. www.kernraceway.com SATURDAY, MARCH 26TH. Clearly proving that they appreciate the support of their racing teams, Kern County RWP will be treating them to a free open practice session this Saturday, on all three of their oval track configurations, from 9am to 5pm. Divisions who normally race on the 1/4 and 1/8 mile ovals will practice during the morning hours. Those who race on the half mile will practice during the afternoon. It's a great opportunity to make those shake down runs prior to Kern County's April 2nd season opener and save some money too. 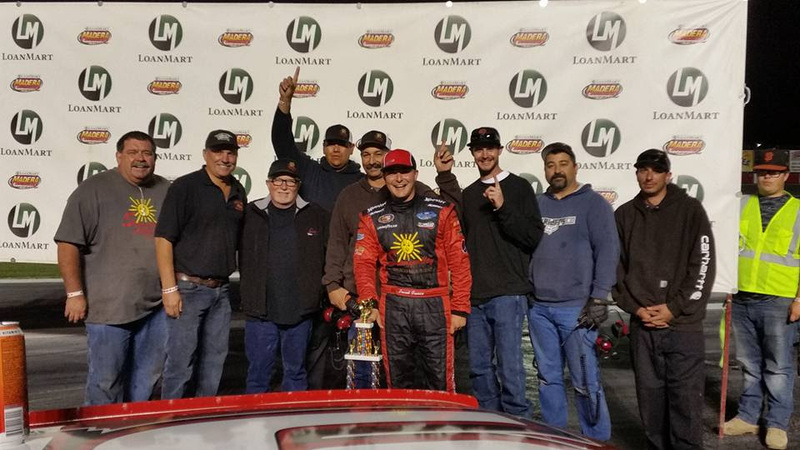 MADERA, CALIFORNIA (March 19, 2016) - Jacob Gomes led 71 laps and pulled away by nearly half a second after a lap 55 restart, to claim his first career Pacific Challenge Series presented by PenneyLawyers.com victory at Madera Speedway. The victory on Saturday night added to the resume of the 2015 SRL Southwest Tour champion and came over 2012 PCS champion and Kulwicki Driver Development member Jeremy Doss. Gomes, the Manteca racer, started on the pole position for the Smokey Hanoian 75 after winning the American Racer dash for a set of tires. Ross Strmiska led the opening four laps of the contest before Gomes broke free and never relented despite several mid-race caution periods. The race also marked the first in series history to be televised for MAVTV. Strmiska took the lead from the outside pole at the initial green flag and the top-six singled out early while Jeff Bischofberger and 2014 champion Mike Beeler battled for position seven. Beeler cleared Bischofberger on the outside on lap four. 2015 Roseville PCS race winners Kyle Gottula and Shannon Mansch tangled on lap four in turn one for the first stoppage of the event. Both restarted at the rear. Gomes used the restart to rocket past Strmiska as a quick yellow came out for Mike Hite getting sideways in turn four. Gomes completed the lap five pass before the caution came out and he maintained the lead. Doss started the race sixth and found the outside to his liking to advance to third. The intense battling between Bischofberger and Beeler boiled over with Bischofberger doing a 360 degree maneuver down the front stretch to bring out a lap eight yellow. Hite suffered damage as cars slowed and was done for the evening. Valley Springs' Tracy Bolin set the new track record with a 14.173 second lap and used the restart to slide past Doss and dive inside Strmiska. Bolin spun to bring out another caution on lap nine. Jimmy Stillman found himself battling with Beeler on the next restart with that battle going south on lap 13 with Stillman spinning. After that series of cautions, Mansch had found herself advancing all the way to fifth position despite the earlier spin. Mansch staged an exciting battle with 2015 Rookie of the Year Cole Moore before they got together sending Mansch for another spin on lap 20. Bolin dropped out of the top-five on the next restart with an apparent mechanical problem coming out of turn two. The race went green for the next 35 laps with Hodges also suffering mechanical failure and escaping to the pits just past halfway. Gomes was in cruise control over the lengthy green flag run while Strmiska tried to fend off Doss. Doss finally got the deal done down the inside on the backstretch on lap 51. A caution flew four laps later when Mansch and Chris Scribner were spun around in turn three. That lap 55 restart set up a wild crash that punctuated the race for many. Gomes picked the outside of Doss but it was the second row where Strmiska washed across the race track into Gottula. Gottula spun and collected several cars including Milburn, Mansch, Cole Moore, and JR Courage. Strmiska, Gottula, Milburn, and Mansch suffered terminal damage to end their evening. The next restart ended up being the last restart with Gomes motoring away from Doss. Doss faced opposition from his teammate Bischofberger for several laps before Doss drove away. Doss ran some of his best laps of the race in the final laps to close the gap on Gomes but he came up three car lengths short. Gomes took his first Madera touring win of his successful young career over Doss, Bischofberger, John Moore, Darrell Midgley, and Scribner. The Pacific Challenge Series presented by PenneyLawyers.com takes a break for a few weeks before returning for round two at All American Speedway in Roseville, CA on April 16th.